The Immucox® vaccine is applied to chicks using a Desvac Duo gel component, available from CEVA Animal Health. 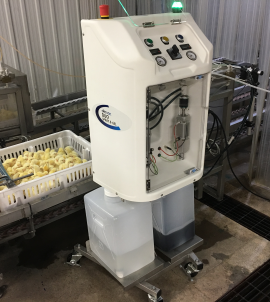 This semi-automatic conveyor-type applicator applies the vaccine using a bar which delivers the gel drops onto the chicks in the crate or box. 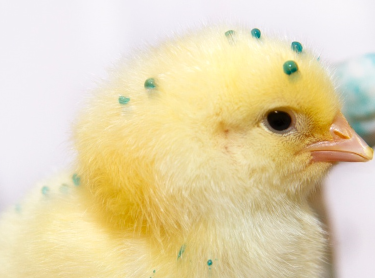 Unlike applicators that use coarse sprays and require repeated applications to ensure a uniform vaccine uptake, the Gel Droplet applicator ensures chicks receive the correct vaccine dose with a single pass under the spray. As well, since gel droplets are used to administer the vaccine, the chicks are not wet after the vaccination process. Although not routinely used, applying the Immucox® vaccine using a hand sprayer in the field is an option. However, the potential for non-uniform application is high and may result in a sub optimal immune response by the flock.